On the verge of her fortieth birthday and shaken by a recent miscarriage, Emily inherits an abandoned summer camp in Massachusetts. She and her husband move onto the property and make grand plans to revitalize the land. But they soon discover that their inheritance includes an unexpected guest. On a walk through the old campgrounds she once frequented as a girl, Emily finds, living undetected in one of the cabins, a magnetic twenty-two-year-old named Stella. As the two women begin spending time together--talking and drinking, swimming in the lake, watching seductive French films through long afternoons--Emily finds herself playing at performing various roles relative to Stella: friend, mother, lover. Each encounter they share promises to bring Emily a little closer to an understanding of her own identity, but it also puts her marriage and future at risk. How much does she really know about Stella? Why is Stella here, and what does she want, and what might she take with her, if and when she leaves? 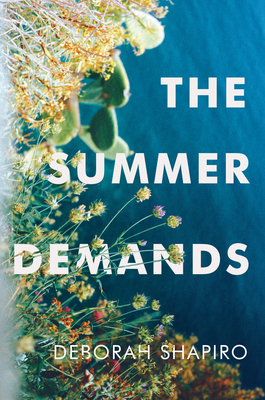 Taking place over a single summer in a landscape that refuses to be tamed, The Summer Demands is a beautiful, quietly startling exploration of the sting of seduction, of unspoken female rage, and of how desire and ambition shift over time. It advances Deborah Shapiro's place as one of America's most captivating writers--a novelist who "adroitly conveys women's complicated intimacy" (The New York Times Book Review). DEBORAH SHAPIRO was born and raised outside of Boston, Massachusetts. Her writing has appeared in The New York Times Book Review, Los Angeles Review of Books, Sight Unseen, Tin House, and elsewhere. Her first novel, The Sun in Your Eyes, was selected as an Editors' Choice by The New York Times Book Review, as well as one of the season's best reads by Harper's Bazaar, The Wall Street Journal Magazine, Chicago Tribune, and Vulture, among other publications. She lives with her husband and son in Chicago.